Author Mary Hawkins at the launch of the second book in the Baragula series, Outback from Baragula. Image courtesy Rose Frankcombe. 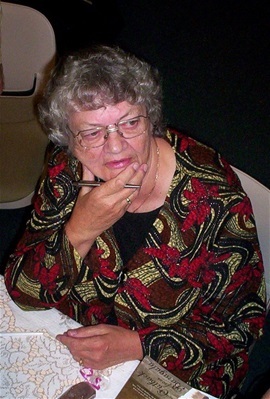 A best-selling author with nineteen titles, Mary grew up on the Darling Downs in Queensland. After training as a registered nurse, she then completed a Diploma at a Bible College in Sydney where she met her husband-to-be. Being a farmer’s daughter, nurse and minister’s wife helped equip her to create stories with a big Australian country feel, medical and spiritual content. Her first contract was with Harlequin Mills and Boon for a medical romance and was quickly followed by contracts with Heartsong Presents and Barbour Publishing in America. However, after several medicals, she decided to concentrate on writing inspirationals, both contemporary and historical. In recent years she completed the Baragula trilogy: Return to Baragula, Outback from Baragula and Justice at Baragula published by Ark House Press. These are still available in print, but now with the emerging electronic media taking hold, Mary's back-list stories are also being released again as e-books. Having lived in Tasmania for a number of years, Mary still leads an active and busy writing life, presenting workshops and taking speaking engagements as she mentors new and emerging writers. JUST RELEASED AS E-BOOKS! The Search Series! NOW AVAILABLE AS E-BOOKS! Re-released works by Mary Hawkins. The Baragula trilogy. The Baragula trilogy The Baragula trilogy by Mary Hawkins.